P2Pb2b is a pathbreaking exchange that assures lightning fast transaction, very nominal trading fees and the most advanced security measures for safe trading. 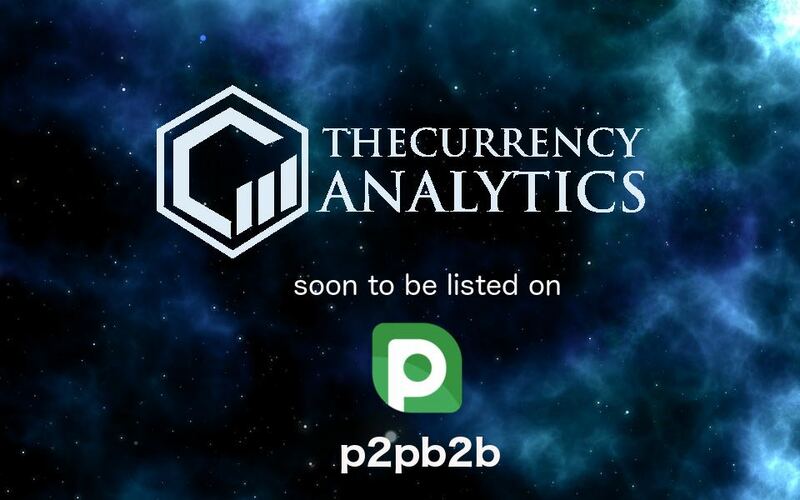 The Currency Analytics has recently announced the upcoming listing of its signature TCAT token on futuristic crypto exchange P2Pb2b. An emerging favorite among crypto traders, P2Pb2b enables individuals and businesses to trade crypto coins safely with minimal fees. The exchange comes at the top 38th position in CoinMarketCap. “We are excited to announce the upcoming listing of TCAT on P2Pb2b. The rapidly growing exchange has made quite a name for itself within a short time and for all the great reasons. What we especially love about the exchange is its low commissions, state of the art security measures and superior lightning-fast performance. All these factors together make it the best for trading. We are always concerned about the convenience, safety and comfort of our TCAT traders. And, we are happy to be able to allow them to trade in a high performance and highly credible crypto exchange like P2Pb2b”, stated Sydney Ifergan, senior ICO expert and the key person from The Currency Analytics. P2Pb2b is renowned for its superior performance in the crypto exchange scene. The exchange enables dashboard download via SPA in just msec with a blazing processing speed of 10,000 trades/second. In regards to exchange fees, P2Pb2b rates are incredibly low. The exchange charges no fee on ETH & BTC deposit and a very nominal 0.2% trading fee. Transaction is completely free between P2P users. Additionally, the exchange extends a handsome referral scheme where each user holds the chance to win a whooping $1,000,000 by referring a friend. As per the statements of Mr. Ifergan, the exchange assures the most secured trading with its versatile and advanced security measures. P2Pb2b stores 96% of its currency in cold wallets and has already adopted state of the art security measures like IP detection and 2 Factor Authentication. We are extremely particular about thorough verification of all coins before listing them on our exchange. We only choose coins that can promise to add some value and can assure liquidity. TCAT has won us with its revolutionary mission and we are excited to have it on our exchange noted a senior spokesperson from P2Pb2b. The exchange assures 24/7 support and multi-lingual interface in 8 languages.